The following recipe is from Leanne Brown’s book Good and Cheap: Eat Well on $4/Day (also available as a free downloadable PDF from her website). The book began as a project for her master’s degree in food studies at New York University to explore what eating well on a SNAP (food stamp) budget could look like—and from there, it went viral. The book is a great resource for anyone who wants to cook delicious food that won’t break your budget. We use her book in many of our classes at the Culinary Literacy Center and hosted Leanne for a demonstration and book signing in October 2015. Check out Leanne making Things on Toast with students from the Vetri Community Partnership on Free Library of Philadelphia's Culinary Literacy Center Facebook page! Add the spinach and soy sauce and cook for 2 minutes, until the spinach has wilted and shrunk. Turn off the heat and add the sesame oil and salt. Mix and taste. Remove the spinach from the pan and squeeze out any excess moisture. 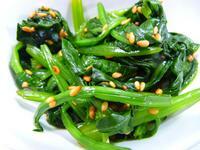 Korean-style spinach is delicious on toast.